Interactive entertainment is more than just fun and games. These 3 video game companies could enrich your investment portfolio. Video games have never been bigger, and it looks like the industry is poised to keep right on growing. Gaming revenues grew four times faster than the U.S. economy in 2014, and research firm Gartner anticipates that total industry revenues will exceed $111 billion in 2015. Hitting that figure would represent nearly 20% growth on the approximately $93 billion in global sales in 2013. With such a strong growth outlook for the industry at large, now could be a great time to consider adding some gaming stocks to your portfolio. Here's why Take-Two Interactive (NASDAQ:TTWO), Activision Blizzard (NASDAQ:ATVI), and Electronic Arts (NASDAQ:EA) should be on your watch list. Take-Two Interactive is best-known as the publisher of the monstrously successful Grand Theft Auto series, the last installment of which has shipped a staggering 52 million copies. While GTA is undeniably the small-cap company's bread and butter and biggest asset, Take-Two is proving that it's not a one-trick pony. The company has solidified itself as a major player in the sports genre, with NBA 2K14 coming in as the seventh-best-selling game in 2014 and WWE 15 also delivering a solid commercial performance. 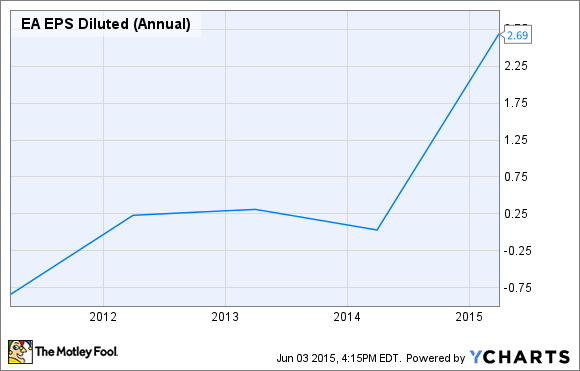 The company's stock has gained roughly 61% since the beginning of 2014, and more than 148% over the last five years. With a market cap of roughly $2.4 billion and cash and short-term investments of roughly $1.1 billion, the company has a solid balance sheet. For an interesting bit of context, 2013's Grand Theft Auto 5 did more than $1 billion in sales in its first three days on the market. Prospective investors should know that the company's earnings are uneven even by the standards of the highly cyclical games industry, and its best years depend on a big Grand Theft Auto release even as the company is making significant progress in expanding its cache of franchises. Evidencing this trend, the company has a trailing-12-month P/E value of about 7.4 and a forward P/E value of roughly 53. With properties like Call of Duty, World of Warcraft, Destiny, and Skylanders, Activision Blizzard owns some of the most valuable properties in gaming. Company stock is up roughly 29% YTD and 140% over the last five years. Its still-very-important World of Warcraft has actually seen substantial subscriber erosion recently, losing 3 million subscribers in the first quarter of 2015, however the company's stock still trades near all-time highs thanks to great momentum on other fronts. The company has been delivering stellar digital revenue growth, with the company's last quarterly report bringing a 58% year-over-year increase in digital content and subscriptions, and it's also making some big progress in the mobile sector. With a forward P/E value of approximately 23, Activision Blizzard is above the S&P 500 average of roughly 18, however the company appears quite capable of delivering on the growth priced into its valuation. The company also pays an annual dividend, which currently yields about 0.9%. With a payout ratio of just 20.4%, Activision Blizzard has plenty of room to raise its dividend, and could become the first pure-play gaming publisher to make returned income a major part of its stock appeal. Like Activision Blizzard, Electronic Arts has a well-diversified range of blockbuster franchises. Annual releases in the FIFA, Madden, and Battlefield series provide the company with large and reliable revenue streams, and the company is delivering great digital revenue growth that has enabled it to increase its operating margin from 10% to roughly 25% in a year's time. This momentum is delivering great earnings growth for investors, and the turnaround over the last five years is undeniably impressive. With a forward P/E ratio of roughly 27, EA is priced for growth, but the stock does not look unreasonably priced given the company's strong position and tailwinds in the gaming industry. Long a powerhouse in the console games sphere, the company is now making major progress in the rapidly growing mobile arena. EA's strength is built on valuable licensed IPs, and the company is utilizing key properties like FIFA, Madden, and The Simpsons to propel mobile revenues to new heights. The company's 2015 lineup looks strong, with releases in some of its biggest franchises as well as Star Wars Battlefront -- the first triple-A game to stem from its 10-year license extension with Disney. As long as gaming continues to see solid growth, EA looks to be in good shape.